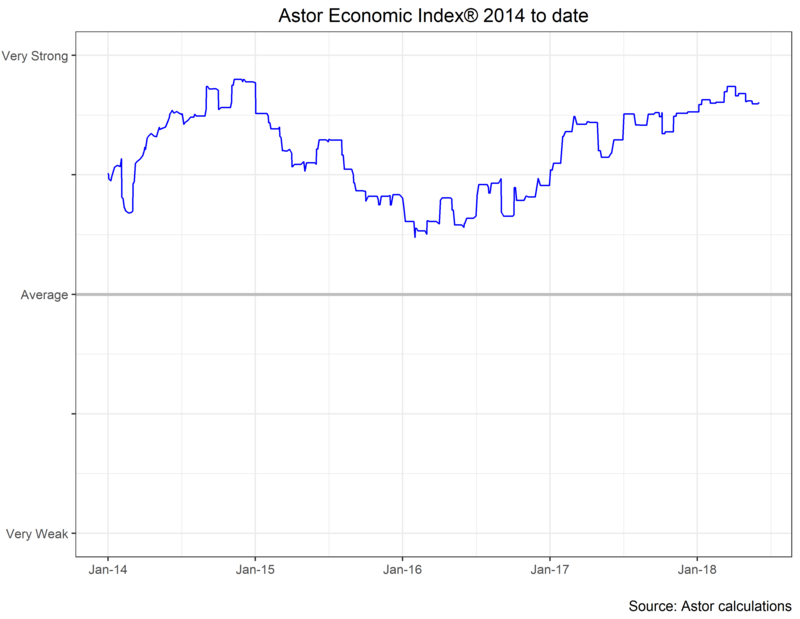 Our proprietary Astor Economic Index® is still showing strong growth in the US economy. The index is currently near the top of the fairly narrow range it has been in the last twelve months. The labor market continues to add more jobs than is required to keep up with the natural growth of population and consequently the unemployment rate continues to fall. The unemployment rate is now at its lowest rate in 18 years. It has become commonplace to say that the US does not have a shortage of skilled labor, but a lack of employers willing to offer a higher wage. There are some nascent signs that this may be easing, and thicker pay packets would be good news for the economy as a whole. In general, while the year over year change in average hourly earnings has been in a fairly narrow band over the last eighteen months or so, another measure (wages and salaries from the National Compensation Survey) is perhaps showing signs of more steady growth. I would like to see a few more quarters of a larger gap between wages and inflation. While the international environment continues to be supportive, there are of course a few storm clouds on the horizon. 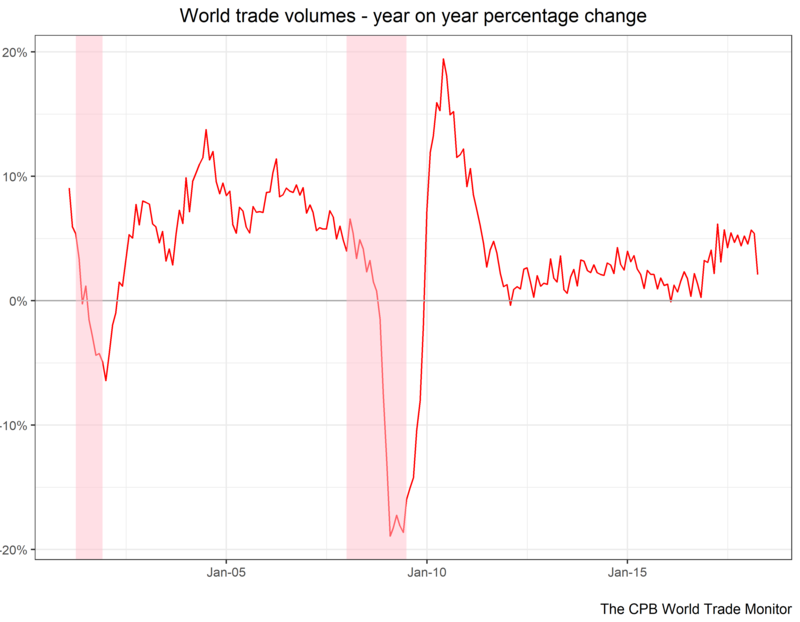 The latest data we have shows that trade continues to tick over at a decent pace for the post-recession period. While there is a downswing at the end of the series and while it bears watching, my first impression is that it merely returns the series to the recent average off some slightly anomalous strength. That being said, investors increasingly wonder how long trade peace will prevail. The major threat is the possibility of a cycle of US-initiated worldwide tariff increases. Some of the tariffs mooted over the last few months will begin to bite over the summer and as they do we can expect some counter-duties from our trading partners. As we noted the day after the election, the president has a great deal of latitude to set tariffs if he wants to be aggressive and the treaty-based or legal remedies can take quite some time to take effect. I think in the end the tariffs enacted will only have a modest reduction in US growth and a modest increase in inflation, but the risk is that both of those numbers could go strongly the undesirable way. I think that in light of the strong labor market as well as inflation moving up closer to its goal, the Fed will raise rates again in June. The most common interpretation of the Fed Funds Futures curve shows that the that hikes in June and September are priced in, though the market is uncertain of a fourth hike in 2018. Two more hikes would bring the target rate to 2.25%, roughly where the FOMC sees the rate ending the year. The committee sees an additional 0.75% in 2019 so if they are correct, and they are of course the ones who get to decide, the upward move in rates will begin to slow economic performance (by moving real rates above the neutral level) sometime twelve to eighteen months from now. As always, we at Astor will be monitoring the economy closely to inform our investment decisions. To see more of our weekly collection of economic charts, visit www.astorim.com/charts.